Welcome to the Marvel NOW! 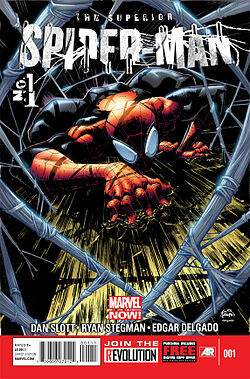 Universe the premiere issues of “The Superior Spider-Man” which comes about a month after the cancellation of the long running “The Amazing Spider-Man” title that ended last December with issue #700. So you all know a bit more about the premise of this new series, I have taken it from the official Wikipedia page of the title to bring you up to speed. Check it out. PiercingMetal Thoughts: Personally speaking I think that this is a wild premise for sure and since I grew up on the classic tales of the Web-Slinger and Peter Parker, I hope that his death was not exactly as it seemed and we find him back in the red and blue costume once again. I’ll likely be checking out this title when several issues are collected into a trade paperback or something but based on collecting space and time will not be able to snag each and every issue as it hits the stands in that fashion. What do you fans of Spider-Man think of this new and very different direction and the new premise? I will leave the comments open for you to offer up those views. I look forward to hearing from you about it.